M.S. Data Visualization Student, Will Su exhibits at the Jefferson Market Library! 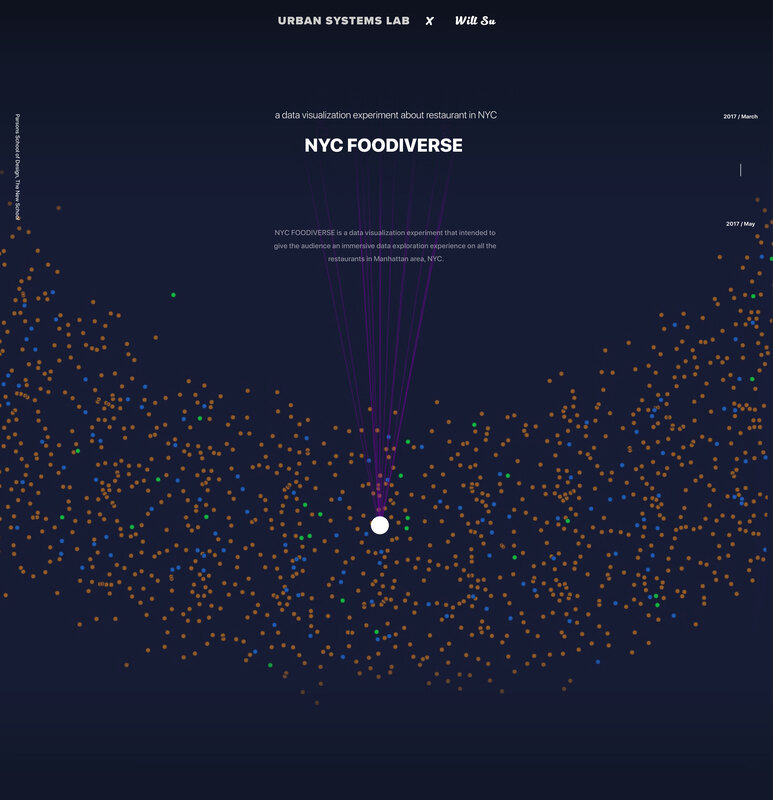 New York’s celebrated and diverse restaurant culture at “the center of the universe” inspired FOODIVERSE, an interactive, digital visualization of food quality and customer experience in all Manhattan restaurants. It integrates data from the NYC Department of Health and Foursquare to show restaurant grades, sanitation violations, Foursquare reviews, ratings, and price tiers. Explore the data from multiple views: a playful distribution of the FOODIVERSE, a map, or a custom graphical view, specified by choosing your own axis variables. Bio: Will Su is a designer who is passionate about coding. His work focuses on presenting data efficiently and beautifully with fluid interactivity. He is currently pursuing an MS in data visualization at the Parsons School of Design in New York, where he creates work that sits at the intersection of design, statistics, and computer science. Will is also working part-time as data visualization engineer with Viacom’s data strategy team, where he collaborates with developers and data scientists to build data-driven products that enable the company to make better executive decisions through engineered intelligence.